Pop culture encourages misperceptions about a lot of things, including nuclear power. Here are the facts. 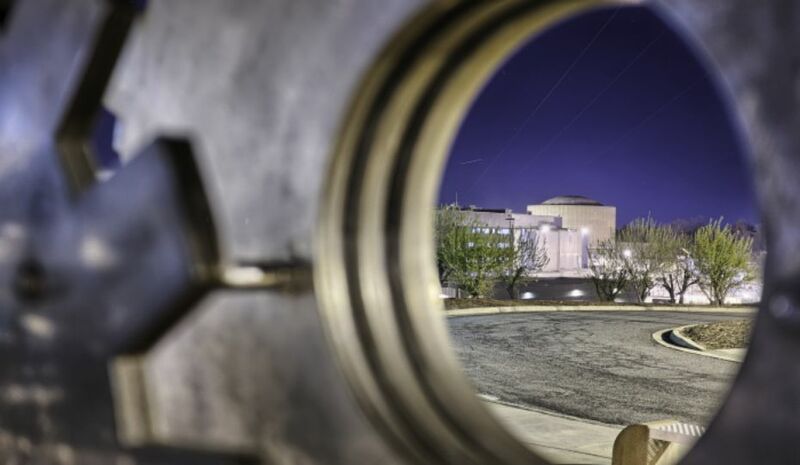 Note: This story first appeared on Duke Energy's storytelling website, illumination. TV shows exploit incorrect information or ideas for the sake of drama. Viewers like a good drama, after all. But TV shows and movies are fiction and are not the best sources of accurate information, especially when it comes to nuclear energy. These are nine myths about nuclear power and the facts. Nuclear power is the only energy source that produces electricity 24 hours a day without emitting greenhouse gases, for example. Duke Energy generates power with a diverse mix of fuel sources, including wind and solar, and operates six nuclear plants. 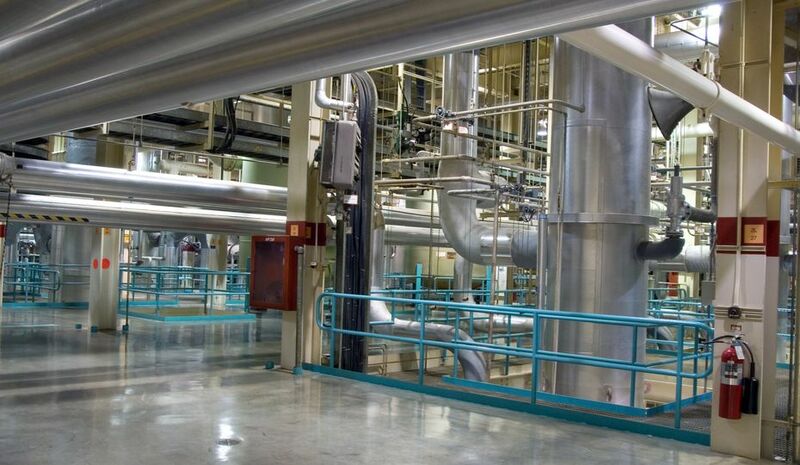 Those plants account for about 50 percent of the company’s power generation in the Carolinas. Facts: Contrary to what you may have seen on “The Simpsons,” nuclear fuel comes in the form of solid uranium fuel pellets stacked inside sealed metal fuel rods. One pellet – about the size of a pencil eraser – produces the same amount of energy as 17,000 cubic feet of natural gas, 149 gallons of oil or nearly 1 ton of coal. Facts: The volume of fuel used across the United States for almost five decades would cover an area the size of a football field to a depth of less than 10 yards. If all the electricity you used for 70 years was generated at nuclear facilities, the used fuel would fit in a soda can. Facts: In pop culture, nuclear power is often fictionalized to create suspense, like when reactors go “critical” in movies and books. “Critical” simply means that the reactor is in a configuration that will let it operate at a steady power level. When a uranium atom is hit by a neutron it splits apart; a process known as fission. The atom splits into two smaller atoms and emits a few neutrons. To keep reactor power steady, one of those neutrons needs to cause another fission. When the reactor is in a configuration where one neutron from each atom fissioned causes another fission, the reactor is said to be critical. 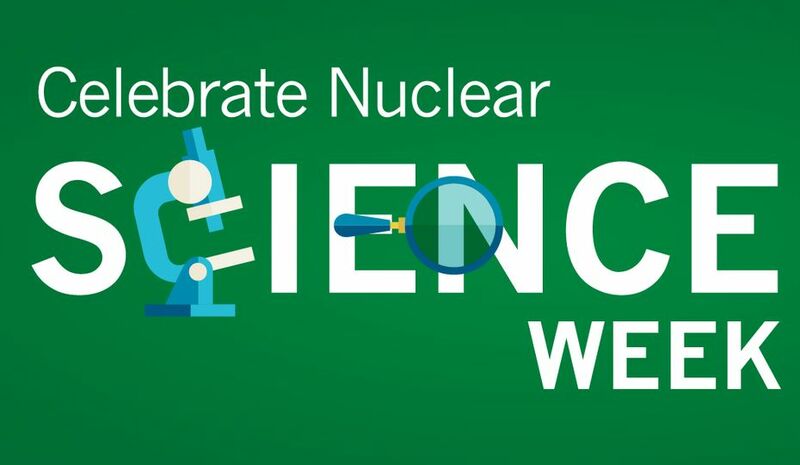 Facts: Nuclear energy is one of the cleanest sources of energy in the United States, emitting no greenhouse gases when generating electricity. It’s our only carbon-free energy source that operates around the clock for 18 to 24 months at a time. Nuclear power plants don’t burn anything. Instead, they split or fission uranium atoms to generate heat. The white plume seen rising from nuclear plants with cooling towers is clean water vapor. 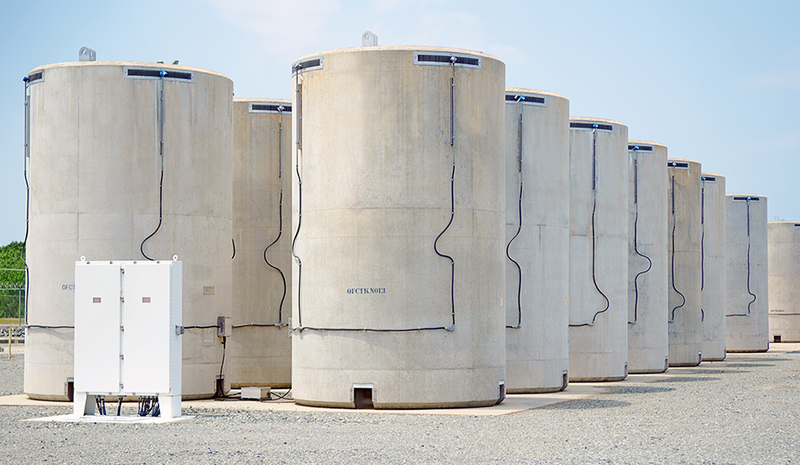 It contains no pollutants, and it is not radioactive – the nuclear process takes place inside a secure containment building, not the cooling tower. Facts: Radiation occurs naturally in our environment. A person who continuously stands outside of a nuclear plant for one year may be exposed to less than 1 millirem of additional radiation. That’s less than one chest X-ray, which is about 4 millirem. The average annual radiation dose per person in the United States is 620 millirem. No radiation-related health effects have been linked to nuclear plants during the nearly 60 years of operation in the United States. 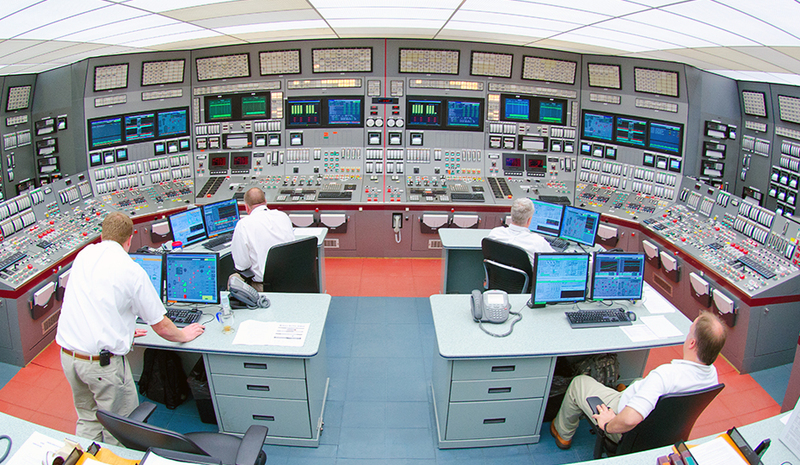 Control room at McGuire Nuclear Station. Facts: Nuclear power plants are among the safest, most secure facilities in the United States. The U.S. Department of Labor says it is safer to work at a nuclear plant than at a fast-food restaurant, grocery store or in real estate. Multiple, robust safety barriers and systems are in place to ensure the safety of the public and plant workers. Nuclear energy is controlled by operators licensed by the Nuclear Regulatory Commission. They receive requalification training every five weeks throughout their career as nuclear control room operators. Facts: It is physically impossible for a U.S. commercial reactor to explode like a nuclear weapon. The fuel does not have enough uranium to be explosive and reactors are designed with layers of safety systems and automatic shutdown capabilities. It is not possible for a person to intentionally or unintentionally modify a commercial nuclear reactor to cause an explosion. The technology used to make uranium and plutonium for nuclear weapons is independent of the technology used to make uranium used in commercial reactors in the United States. Facts: To meet future energy demands, electric utilities will have to depend on an array of energy sources, including wind, solar, biomass, natural gas, coal, hydro and nuclear. Wind and solar cannot provide baseload demand (the minimum amount of electricity required to meet minimum energy demands) because neither technology yields enough power or offers a constant supply of electricity. You left out the mining. You left out the 2 million tons of toxic rare earth type mining per reactor per year or the even worse water system contaminating in situ. Fukushima and Chernobyl exploded. BIg hydrogen and air explosion that blew tons of reactor 1000's of feet into the air and you have the gall to say nuclear power plants can't explode. We all know your "it's not a nuclear explosion" supercilious deceit. And that's what it is: a deceit. Solar, wind, hydro, a day of storage, and waste derived fuels for reserve generators can definitely replace nuclear cheaper and better. Nuclear radiation is dangerous and the IAEA was charter to lie to us and sell nuclear power instead. The Russian and Ukrainian scientist said over a million deaths from chernbols. Do you really believe 4000 thyroid cancers instead like the IAEA said? Have any of you actually read the charter for the IAEA? "ARTICLE II: Objectives The Agency shall seek to accelerate and enlarge the contribution of atomic energy to peace, health and prosperity throughout the world. It shall ensure, so far as it is able, that assistance provided by it or at its request or under its supervision or control is not used in such a way as to further any military purpose. ARTICLE III: Functions A. The Agency is authorized: 1. To encourage and assist research on, and development and practical application of, atomic energy for peaceful uses throughout the world; and, if requested to do so, to act as an intermediary for the purposes of securing the performance of services or the supplying of materials, equipment, or facilities by one member of the Agency for another; and to perform any operation or service useful in research on, or development or practical application of, atomic energy for peaceful purposes;" It's a promotional agencies, yet the lead agency that creates all the standards for measuring radiation and determining health consequences. They are it. Yet they are no different than the tobacco promotional groups. Nuclear power is deadly, dirty, expensive and short of uranium in a decade or so. Informative! Most people, including Americans, don’t understand the difference between fusion and fission And they are susceptible to myths. Can you do an educational project with Nova or Frontline, for example? This was a well done article. Nuclear power plants don't have the pollution that fossil fuel power plants have including using fossil fuel to heat our homes adds to the problem. If we destroy our environment, it won't be Nuclear power that does it. I think France Nuclear power is 80% of their need. The only downside of Nuclear Power is the earthquake in Japan that cause Fukushima nuclear melt down. My understanding of Chernobyl disaster was caused by human error which means the disaster should never happen. Hydro Electric has my vote also. Well done. Hope more people read this and become educated about their environment.